Sometimes you need to communicate a crucial point. To instruct individuals or a team to do something important. To encourage a trainee or team member to change a negative behaviour. It may be vitally important to a patient’s health or the success of your organisation. Fortunately medical training has prepared us well. We know what to do. Present them with the facts. Support the message with data, graphs, risk ratios, tables and diagrams. This will help. Describe the options and the outcomes. Allow questions. Agree a course of action. Check understanding. Arrange to review progress. People will then do what is best for themselves, society, or in the case of staff, the practice. Lose weight, complete the QOF prompts. They’ll be responsive to a logical case well made and do the right thing. Won’t they? All too often, I find that, they don’t. You will all recognise this story. Tom is a smoker and we want to convince him to stop. We tell Tom that smoking kills 96,000 people a year in the UK, will shorten your life by an average of 10 years and that 80% of lung cancers are caused by smoking. The list of impacts and risks goes on. The logical case for stopping smoking is overwhelming. But, Tom had a friend… Bill. He smoked for 50 years and was fine. Until he stopped smoking. Since he stopped he had never coughed so much. He developed “heart trouble”, deteriorated and died. Bill always said that it was when he stopped smoking that his health started to go down hill. Patients like Tom often show us the power of anecdotes and stories, and that they can be more compelling than the clearest of figures and facts. It seems that many medics are missing a trick when communicating, motivating and leading. The use of stories and narrative are a great tool, and many professionals with technical and scientific backgrounds can under appreciate their impact. I have a confession to make. I’m not very good at telling stories. Like many medics, at school my natural strengths presented first in technical and scientific subjects and I was encouraged to focus my learning and development in these areas. Over time, I came to define myself as a logical thinker and communicator, as a scientist. At school and later at university and beyond, my education didn’t involve all that much creativity and came to be very technical, fact based and scientific. Creativity, I came to think, was ambiguous. Inventing realities or retelling events with embellishments to add interest and emphasis just added inaccuracy. It wasn’t faithful. It was best avoided where possible in favour of tried and tested logical fact based argument. Right? People have been communicating with stories for millennia. Much longer than they have been using scientific reasoning, facts and logic. Some of the oldest pieces of human knowledge have survived for so long because they became part of great stories. Such examples might include Homer’s Iliad or religious parables. Narrative has proven itself to be an effective, efficient and enduring vessel capable of transmitting values, culture, life saving behaviours and vital skills across generations and thousands of years. Stories enrich a listener’s experience of the information being conveyed. They add layers of humour, emotion, fear, jeopardy and empathy, making the information much more engaging, memorable and impactful. They are made to be retold so that the information is spread and propagated. The process of constructing a narrative and telling a story proved helpful when the practice received its CQC inspection earlier this year. We were aware that CQC can have difficulty appreciating the performance of a “practice in improvement”. Our practice has seen big changes over the last few years. We have lost senior partners and a practice manager and went through a difficult period where we really struggled to recruit. The new team (we feel) have made big changes and the practice has improved enormously. However, much of our historical feedback and metrics, such as measures of patient satisfaction, lag behind this. On paper, aspects of the practice still look disappointing. We have also been through some unusual events, such as the several months and much effort spent to support a neighbouring practice struggling with closure. Whilst being hugely important in safeguarding the care of patients in our area, this action delayed our own improvements significantly. Developments like these are not easy for outsiders making a single visit to the practice to appreciate. We decided that in order for the CQC inspectors to really understand the practice, we needed to take the initiative and create and tell our practice story. The CQC presentation represented the main opportunity to do this. But, it was also important that they heard consistent and complementary narratives as they spoke to individuals and groups of our staff. The time spent together constructing both our overall narrative and smaller complimentary stories meant that on the day of the inspection, staff, management and partners were able to give a consistent and positive description of the practice. Conveying its identity, values and culture, and trajectory of improvement far more effectively than a dryer presentation of facts and figures. We found the process of creating our story to be enormously beneficial for the practice and received good feedback from the inspection team about it on the day. At present we are still awaiting our rating. Involve everyone – We worked with our whole staff and our patient group over several meetings to craft the basic narrative of our practice. Important questions included; What is important to us? Where have we come from? What are we good and bad at? Where are we going? Portray a noble and just “hero” – The protagonist of the story was our practice, its staff (and also its patients). It was important to portray a hero (the practice) who possessed the right qualities, values and culture. We were mindful to show that we; learn from our mistakes, listen to and change in response to criticism and feedback and have self awareness of our strengths and challenges. It was important to show that we take responsibility for our position and do not fall into the trap of blaming our patients, community, or circumstances for our problems. Use data to enrich the story – We did use data and statistics. But, these were used to compliment our overall message. Take the listener on a journey – We conveyed a sense of a journey along a path which initially headed through difficult times. With two steps forward often followed by one or more steps back. But eventually leading to a position of accumulating improvement in the present and forward into the future with an upwards trajectory. Don’t be afraid to be emotive – We deliberately highlighted points of jeopardy, lows and highs and a few points of humour. These are the plot devices which transform a dull sequence of events into an engaging and memorable experience. A good story. Get everyone telling stories – We encouraged staff to tell their own positive stories about the practice and how they go about their work. We encouraged them to share these rich examples with each other first and also with the inspectors if they had an opportunity. Of course, stories aren’t just written or spoken. There are other vehicles through which a story can be used to convey a complicated but important message. This video from the Royal Australian College of General Practitioners makes a powerful statement about the value of General Practice that would be difficult to make in any other way. I would encourage you all to watch it. I continue to experiment with narrative as a tool to educate and motivate. Having spent many years almost ignoring this useful skill I have some catching up to do. 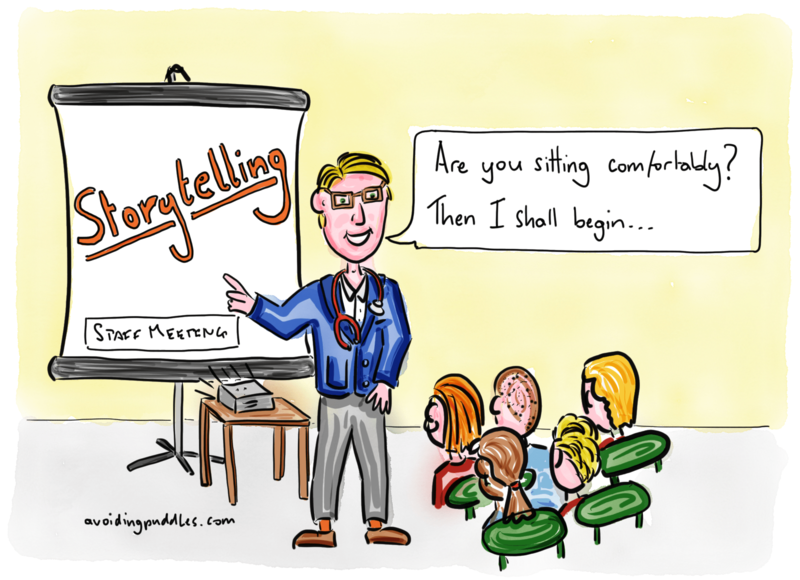 Do you use stories in your professional life? Another interesting and informative blog. I feel this advice could be used in other professions too! Thanks for the encouragement. I have some interesting posts planned for the next few weeks/months. Be sure to watch this space and subscribe for updates. A great viewpoint again. Also glad to see my sharing of information had an impact. Agree the RACGP video is a truly powerful piece of media about General Practice. The RACGP video is great. I would love to see a RCGP UK remake. Continuity is the USP of the General Practice Partnership Model. Cheers for the advice and encouragement! Next Next post: Seven reasons a GP is excited about Pokemon Go?